Winner of the 2008 Jolt Productivity award. Woo! This book is a reality-based guide for modern projects. You'll learn how to recognize your project's potholes and ruts, and determine the best way to fix problems—without causing more problems. Well, many of them are right—under certain conditions. Since each project is unique, you will need to evaluate your context (the project, the project team, and the business in which you’re working) and then make pragmatic choices about what will work and what won’t. Every day your projects become faster-paced, your customers grow more impatient, and there is less and less tolerance for products that don’t work. What worked before might have been good enough to get you here, but the chances that it will work in the future are not good. You must take advantage of all practices and techniques to reduce your project’s risk, including considering agile techniques for every project. This book is a risk-based guide to making good decisions about how to plan and guide your projects. It will help software project managers, team members, and software managers succeed. Much of the information also applies if you are building more tangible products, such as a house or a circuit board, or if you are managing a service project. It’s harder to manage software projects than it is to manage projects that have a tangible deliverable. Software is ephemeral—not concrete, not material, not created out of substance—so we can’t touch it, we can’t directly measure it, and we can’t see it. It’s harder to see the product unfold, and it’s harder to see and anticipate the risks—so it’s much harder to deal with risks. The way we practice software product development does not always help us see where the project is or where it’s heading. So, what do you do when you can’t directly see project progress? What do you do when you suspect the project smells funny, and you think it might be headed toward disaster? How do you deal with stakeholders who don’t want to make the decisions that will help you create a successful project? This book is about providing insight into your software projects and managing the risks that arise from within the project as well as the risks with which you start your projects. From chartering to release, each chapter discusses ways you can see inside your software project, measure it, feel it, taste it, and smell it. 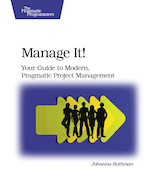 One thing you won’t find in this book is the One True Way to manage projects. There is no One True Way that works for all projects. You also won’t find best practices. I’ll suggest helpful practices for each life cycle that might help you and the project team achieve your goals. You’ll notice that there are forward and backward references in this book. That’s because a project is a nonlinear system. Your early decisions for your current project have implications for how you’ll finish this one—and possibly how you’ll start the next one. How you manage projects might affect the way you can manage the product backlog or project portfolio. All the templates in this book are also here, or at the Prag's Manage It! page. You can buy the book from the Pragmatic Bookshelf both in print or in DRM-free electronic copy (which includes pdf, mobi and Kindle version) or from Amazon in print only. Buy Manage It! in print from Amazon. Manage It! has been translated into Chinese (Turing Book (Posts and Telecom Press)), Japanese (Ohmsha), and Korean (Wikibooks). It is also available as an Indian Reprint (Shroff). Pingback: Ceiba3D Studio | We Need Planning; Do We Need Estimation? Pingback: Indie Game Developer！ | We Need Planning; Do We Need Estimation?